Interests - likes Boogie Beebies, Doctor Who, Scooby Doo, Tom and Jerry, Toy Story, musical instruments. After months of hospital stays, EEG’s, MRI scans, and blood tests, we were given the diagnosis of Temporal Lobe Epilepsy, caused by a lesion, probably a cyst, in his left temporal lobe. 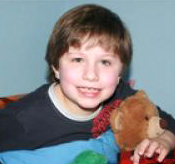 Sam continues to have up to 20 seizures in any one day, causing him to feel tired and dazed for much of the time. His current medication is not having any effect on the episodes. We had our first appointment with the neurologist at Great Ormond Street on Tuesday, and he has suggested a change of medication, a further MRI, and an overnight, with a view to possible surgery to remove the cyst, which is scary, but I think we would consider anything which may help at the moment. Sam attends a mainstream playgroup and a special needs playgroup at the moment and is doing so well that in September he will be beginning at a nursery 5 afternoons a week, supported by a 1:1 teaching assistant due to his epilepsy and personal care. Sam is such a loving and loveable little boy, full of cuddles and his is so happy, but he can also be a monkey, full of mischief and giggles. He is loved to bits by his brother and sister, and they worry a lot about Sam. Sam has Complex Partial Seizures, lasting around 1 minute, which are very frightening to watch and we have not got used to seeing Sam experience them. He looks terrified during a seizure, but copes amazingly well, and seems to recover quickly from a seizure. We are hoping that over the next year, Sam will become seizure free, one way or another, and we look forward to that day. Until then we are taking each day as it comes. Epilepsy is so unpredictable, it is hard to make plans for the future, but giving Sam the best chance we can and seeing Sam happy here makes it all worth waiting for. Sam is having an up and down month. He loved Christmas but found it very stressful and it was his 8th birthday on 1st January – thank you so much for all the gorgeous presents and post he received, we were blown away by your generosity again!!! It is not ideal for someone with epilepsy and autism to have a birthday so close to Christmas, its too much too close together, so we decided next year we will save his birthday until a couple of weeks later so its better for him and he has time to look forward to it. Sam is getting by day to day and making good progress with his speech and communication, but he gets really frustrated sometimes and lashes out which we can understand, but it is hard to cope with when he shouts and screams constantly. Sam still wears a nappy in bed which he absolutely loathes and he gets so angry each night. We’re trying to think of ways to encourage his dryness, but apart from limiting his juice we are stuck!!! And the sleeping isn’t great at the moment, I think we need to look at the meds again soon for his sleep, and the others too as he has grown so much they may all need the dosage changed. Sam is coping OK with everything so far this winter. The winter is generally a hard time for him when he becomes a bit down and depressed, as he loves getting out and about in the fresh air, and as the nights draw in he finds it hard to cope. Last year he got measles which was a terrible ordeal for us all to face and he did not completely recover until April. This still haunts him and he often says ‘measles is gone now, have I got spots now or are they gone?’. He is not sleeping great and finds it hard to drop off, but he is frequently awake until after midnight, which is wearing on us all. Sam’s reflux seems to have returned with a vengeance and occurring daily. His seizures are still under control but could be occurring, manifesting themselves in a different way. We are due to have another appointment at GOSH in the New Year. Many many thanks to all who have sent Halloween gifts, the children have been overwhelmed with your kindness. Thanks to Lauren, S.R Gilligan, and many others. Sophie and Sam loved the bags and cards and even Joe was pleased with his Halloween gifts. We have been making the Post Pals Christmas cards pictures and enjoyed doing them a lot. Sam has had a great summer and is enjoying being back at school. This is usually a very hard time of year for Sam, and he begins to go downhill in both his health and behaviour during the winter months, so we are all keeping a close eye on him to make sure we notice if he begins to show signs this is beginning to happen. We are not sure why this happens – last year he got measles in December and was unwell for 2 months beforehand too, in fact he did not get back to normal until the April following this. He seems very depressed in winter as the weather gets colder, and he can’t run about as much outside due to the bad weather. At the moment he is fine though, we had results back from last EEG in May, and it seems the seizures are under control at present, which is great news. So many thank you’s for all the wonderful post we have been getting, we are so grateful. We have had Legoland tickets from Post Pals, and letters and gifts from across the globe. Some great balloons arrived in the post yesterday, the children love opening the post and on hard days it really brings a smile to their faces. Times are hard here and everywhere else and there’s no spare money for treats what with Christmas coming, so we really appreciate your kindness. Sam is really desperate to go on a plane and we are lucky enough to have a friend who has arranged for him and I to go on a short flight in October, so we are really excited!! Sophie is loving Twilight at the moment, and Sam is into Toy Story, he loves the RC car and Woody goes everywhere with him – he has lost his boots and his hand and he is still Sam’s favourite!! Hope all Pals are doing as well as possible at the moment and thank you again. Sam and Joe and Sophie have been getting lots of super post from all over the world recently, with some amazing gifts and cards from Marjolijn from the Netherlands. Thank you SO much. The children are over the moon with their cards and presents, Sophie loves to hear about your guinea pigs and Joe was thrilled with his World Cup book. Sam loves his instruments too!! They also got some gorgeous post and gifts from Karen Standy from Bedfordshire. Thank you so much, Sam loved his musical toys and Sophie loved the photos of your lovely pets. Sam got a postcard from Darwen, Australia, from Andrea Holmes-Chadwell and also a gorgeous letter from Sean in Ireland which he made himself. Thank you for all your wonderful kindness, we really appreciate it. Sam is becoming easier to handle, but his autism makes it hard for him to have compassion for other people, but he is very loving at times. He struggles with his emotions and quite often is very very happy or very very angry for no apparent reason. Sam has been in Great Ormond Street for 3 days to have a 48 hour EEG and other tests to see if he is still having seizures. He hated being attached to a machine with wires glued to his head for 2 days and nights, but he really tried to be good. He still has his head covered in glue 3 weeks later so I’m going to have his hair cut short! He hates his hair being brushed now as it hurts him so much. We are awaiting an appointment to get the results of the tests. Sam also has to have a blood test next week to check his levels as he is on risperidone, I am dreading this as Sam hates needles. Sophie is doing really well and has her first ice skating competition on 5th July, and her grade 1 piano and grade 2 trumpet on 6th July. So she is a busy girl at the moment. And it’s her 10th birthday on Sunday so she is very excited too!! Joe is looking forward to the World Cup and has planned his life around England’s games!! We are going to the Starlight Wish Party on 29th June; we are lucky to be invited and can’t wait. We also hope to come to the Post Pals party on 26th, and hope to meet lots of other Pals there. Thank you to Viks, Kate, and the team for all your hard work, it means a lot to us. Sam has had a good February on the whole and finally seems to be recovering from the after effects of the measles. He is tolerating more music and songs, and is not completely distraught every time anyone sings a song or turns the radio on. He is slowly getting back to the way he was 3 months ago, enjoying himself playing on the computer and with his new Scooby Doo House toy. We have had a couple of appointments at GOSH, the first to see a clinical neuro psychologist, who assessed him for 4 hours and put his ability at 3 years ten months for one test, and up to 5 years 10 months for another, with the rest falling around the 4 years 8 months level. This is really positive as previously Sam was assessed at the level of a 2 – 3 years old on these tests. He wasn’t too happy sitting for these tests and I think he could probably have done better if he was more cooperative!! On another visit Sam had an MRI Scan to see if there was any change in his brain following his temporal lobe resection which had caused his recent change in temperament. The results were clear with no swelling, regrowth, or pressure apparent, so that is good news. That means the reason for Sam’s recent downturn is probably related to the measles, autism, epilepsy or any of the above. He has been referred for an overnight EEG to assess if there is any underlying electrical activity which could be causing Sam some discomfort. This has come through for the 18th March, so we will see what happens then. We are slowly ruling out each possible factor, and trying to discover the reasons behind why Sam is such a whirlwind of emotions at the moment. As it happens, Sam seems to be finally getting better on his own, though we don’t know why? He is being really loving and affectionate, and I feel we have the connection back that was lost while we were all trying to cope with measles and all its side effects. Many many thanks to everyone for all the lovely post the children received recently. Joe got a book voucher all the way from Houston, Texas, from Mary Johnson. Sophie has been given a gorgeous necklace making machine for Valentines Day, and a paint your own jewellery box. Sam has got a fab Doctor Who book, handmade card and bookmark from Alison. We are so grateful for all your kindness; the children get such joy from Post Pals. We have also had many cards and postcards sending love and kind thoughts – many thanks to everyone who has thought of us. A lot of pals are heading through hard times at the moment and our thoughts are with them and their families. Sorry to say that Sam has not had a very good Christmas at all as he came down with measles on 19th December. This was after being really sad and angry for most of December (which was obviously when the measles was starting). He had a horrible itchy rash, ear infection, conjunctivitis, fever, sleeplessness, and was really angry and screaming a lot as he didn’t understand why he felt so ill. It was a quiet Christmas for us, as we didn’t leave the house for 2 whole weeks. Sam only started to get better on 1st January. He finally started to sleep a little, but he is still very up and down emotionally, easily upset and cannot stand any loud music/songs. We can see he is worse because of the autism, and not being able to understand why things are happening. He has, in general, not coped well with winter this year. He is struggling to cope with school and the demands placed on him. We have got an appointment in February at GOSH, to arrange an MRI scan to check there is no change in his temporal lobe, new growths or pressure etc, so we can rule that out, and try to understand him better and why his emotions are such a roller coaster. The doctor recommended a trial of Risperidone to calm his temper, so we are trying that at the moment. He has also been prescribed Chloral Hydrate for those nights when he awakes at 1am and will not go back to sleep, although thankfully these are not the norm as they were while he was ill over Christmas. Sam’s birthday was on 1st January and we kept things quiet. We just went for lunch at the Harvester, followed by a long walk in the forest, so Sam could get some fresh air and exercise. He did cope well with the day and opened some lovely post – many thanks to everyone who sent both Christmas and birthday gifts to Sam, and Joe and Sophie. The knowledge that people all over the world are thinking of us really helped this Christmas, as it is probably the hardest one we have faced. Joe and Sophie did not get to go out and do a lot, as we were waiting to see if they were going to come down with the measles, but thankfully they didn’t get it and they are all back at school now. We wish all the Pals, volunteers and families, a very Happy and Healthy New Year, and thank you again to all the kind people who sent post for the children and the Schwauer family from the USA. It was lovely to see them open the parcels and cards. Thank you to all of you who have sent post this last month, it is much appreciated. I am keeping the presents for Christmas morning (if I can!) but Sam has loved opening the craft pack he received and we are having a crafty evening in the week, making some cards and decorations. Today we went to the Winter Wonderland in Hyde Park, and saw the circus, did ice skating and lots of rides. Sam lasted well, and apart from a couple of small moments he held himself together, even going on some quite hair-raising rides and a bungee jump!! He usually gets a bit unsure and nervous in crowd situations and with lots of noise, but today he coped with the tube and taxi without too much fuss. I told Sam that Father Christmas can see him through the burglar alarm sensors, and see if he is being good, which made him stand there staring at the corner of the room for 10 minutes, talking to ‘Father Christmas’, and it works if I remind him and takes his mind off his temper sometimes – shame it won’t work after Christmas!! Merry Christmas to all, hope you have the best Christmas possible and a peaceful New Year too. Sam has had some lovely post this month, with lots of emails from all over the world, some great postcards, including one all the way from Japan!! He’s had some super cards too. He loves opening the card and he gives it to me and says ‘What do this say?’. Thank you so much for the wonderful Chinese paper lanterns, we set them off last night and they looked stunning, floating away slowly into the night. We could see them for absolute miles and miles, I wonder where they ended up? Thank you too for the Snowman book and CD, another of Sam’s obsessions, I know that book off by heart now! Sam has stopped wearing nappies at night time, which is a huge step for him, not too many accidents either! Well done Sammy! He went to the opticians yesterday and we were laughing because when he was looking at the chart, he had to name the pictures and he said ”House, Car, Flower, Plane”, then he saw a kettle, and he said ‘Nice cup of tea, Car,” etc, the optician wasn’t amused when we laughed, but that’s Sam all over, doing what he can to communicate, and he usually makes himself understood in the end, even if he’s not using normal words! Sam had his first trick or treating experience last night and we think he really enjoyed it, dressed as a pirate. Hope all the other Pals are doing as well as possible, this is a hard time of year, and we are thinking of all of those facing hard times. Sam has received lots of postcards and notes from the US recently, and a big thank you to Kim Craft who sent Sam a great Fireman Sam Sticker Book, he has had a lot of fun doing the stickers and sends a big hug. Also, thank you to Margret from the USA for her lovely postcards for Joe, Sophie and Sam. Sam has settled in well to his new class at school, and he is amazing us with his ‘writing’ which is random letters jumbled together on a page, to which he says ‘What that say?’ He is really keen to get reading and writing and the speech therapists etc are saying he is functioning at the level of a 4 year old, so he is doing really well, and has made good progress. Most importantly Sam is having a happy time at the moment, with no major problems. He still uses Melatonin at bedtime to help him drift off to sleep, and he is still the most stubborn boy in the world, but there are definite signs he is maturing, and becoming a little less like a terrible two year old! Sam’s autism is the main issue at the moment and this is something he will, and we all will have to learn to live with, but he is a healthy little boy at the moment, free of seizures, and long may it last. Thanks to all the lovely people sending postie to all the Pals, you are making someone smile every time you send something, which is an amazing thing when times are hard. Well Sam went up to the next class at school in September and he seems to have settled in well. He says ‘I love my teacher!’. He still needs Melatonin to help him get off to sleep, which is the only thing to have worked, and we are so grateful, as it means we have some normality with the other children. When Sam didn’t go to bed our whole evenings were taken up with him. One of us had to lie down on the bed with him, sometimes for 3-4 hours, and then he would wake up again by 3-4am, and it was really hard. Now he is asleep by 8 or 8.30 pm and we have time to be with the other two for an hour or two before they go to bed, which is lovely. Sam is still often awake by 5am but you can cope with anything if you’ve had a few hours interrupted sleep!! Sam has really made progress in many areas. His speech is coming along well and his level of comprehension is becoming better. He is able to understand so much more now. I feel we are so lucky to be able to say this, as a couple of years ago things were so up in the air and we didn’t know what the next day would bring, if he would be having 20 seizures or none overnight, and if he would ever be able to use a toilet or not. Sam’s autism was diagnosed last year and he has many typical autistic tendencies, such as flapping his hands and bouncing, and he cannot cope in many social situations. He started Beavers 2 weeks ago, and he is settling in slowly, but after half an hour he says ‘Can we go home now?’ so we are letting him do it at his own pace as he is not used to being in a mainstream group, and I feel he is able to do this, in his own time. We have tried a couple of medications such as Straterra and other ADHD drugs but they didn’t have a positive effect and made him depressed. I am glad we can now rule these out and work with Sam to help him control his own feelings and behaviour. Christmas is around the corner and I am sure he will get lots out of it this year. Sam has been very up and down this last couple of months with his temper being very erratic and he is being exremely loud and shouty! The teachers think this has a lot to do with his brain surgery and the after effects of actually going into his brain, along with his autism and frustration from not being able to communicate as effectively as he wants to. We had a behaviour specialist in yesterday who said she thought he was capable of doing really well, if we can get past the frustration and all the bad tempers. He spent the hour telling her ‘Go home now! I finished now! !’ which I can understand as he is sick of being pulled around and told what to do, but he did sit nicely in short bursts and she thought he did well. We are hoping she will be able to go into school on a weekly basis to offer help and build a relationship with him. We’ll try anything to get throught to him! His sleeping pattern has been awful of late, he has been waking up at 1 or 2am and ready to face the day. We just can’t keep going like this and I am seeing the school doctor on Wednesday to try and get something to help him through the night, as we are all too tired and ratty to cope with anything! Sam is still just Sam though with his funny cheeky personality and (most of the time) we wouldn’t change him at all! He is glad the weather has turned at last and is loving the garden and mum’s swimming pool. Last year he wouldnt go in it, but this year he loves it. Maybe that’s autism for you, or maybe that’s just kids for you. Sam has had a good month, with lots of cards from Post Pals all over the world, many thanks to you all for sending your best wishes to us, we appreciate it loads. Sam has become a lot more vocal in his wants now, saying “I want go there!” or “I want play that!” so it is great to see his personality developing, but also hard as he is so determined to get his own way, and we have to spend a lot of time explaining things in a simple way he can understand. Sophie broke her arm for the third time last Monday and we are beginning to think she could have a problem such as Hypermobility. Poor thing had to spend two nights in hospital and now has a pin in her arm. We are seeing the orthopaedic surgeon tomorrow and will have to pursue this, as things are not looking good – she broke it tripping over while getting off a bed?? All her breaks have been while falling over, once while falling from an armchair onto a carpet! She would love some extra smiles as she is finding it hard being a bit left out, as we have to keep Sam busy. We had a busy Christmas and we send so many thanks to all the Christmas elves and everyone who sent Christmas post to the children as they really had fun opening the presents and cards. Sam had his 6th birthday too and we went to the ball pit with a few friends and cousins which he loved. He got some great birthday post too, big hugs to you all! Sam began a trial of the medication Equasym just after Christmas, which was recommended to us by two different Great Ormond Street Departments. The drug is a reuptake inhibitor, which is supposed to slow down Sam’s reaction time by making the messages to the brain take longer to get there. For most children with autism / ADHD, this is supposed to have the effect of improving concentration and helping to get more out of school. However in Sam’s case the medication just made him very sad. He went from being bubbly and extremely bouncy to being unresponsive and depressed whenever he was given the medication. His teachers at school noted he did a lot more flapping and his processing delay was far worse. We gave up after 5 days and he is back to his usual self, which is great to see. We thought it was worth a try to see if Sam could be helped to maintain his concentration at school, and to minimise his mood swings, but this is not the case. We have all got this rotten cold and cough going around, and we are having a day indoors today, with Sam watching Ratatouille, Wall-e, and playing on his V Smile all day. Joe and Sophie are a bit unimpressed by this but if Sam is happy then we all have a bit of peace. Joe wants to get the wii out soon, so I am taking Sam upstairs to read some books. We had a lovely, busy Christmas, but we have all succumbed to the coughs and colds going around, so we haven’t been up to much else! Sam enjoyed opening his presents and got some super Christmas postie and i have sent some pictures for the gallery. Sam’s current favourite DVD is The Snowman, and he was overjoyed to get the book of the DVD! Joe and Sophie also got some lovely postie, Sophie got some lovely art stuff and girlie bits, and Joe got a great wrestling calendar to name a couple of things. Thank you so much to everyone who sent post to all the children! Sam’s birthday was yesterday so he had yet more presents and cards, and some lovely postie including lots of cards and a lovely soft Wall-e toy from Julie Barrett, which he slept with last night! Sam finds the holidays with no routine a stressful time, and as we have all been unwell and unable to get out, it has been harder for him to cope, so we will all be glad when term starts again. Sam was officially diagnosed with autism and ADHD last month, and we have started a trial of Equasym to see if it helps his attention span, but this was stopped due to having a bad cough and cold, but we will be trying it again once he is better. I would like to wish all the Post Pals staff, volunteers, helpers and families, a Happy and Healthy 2009, thank you so much to you all for including us in your thoughts. Sam enjoyed his summer holidays, even though it was hard for him to understand why there was no school, and even harder for us to find ways of entertaining him! He attended the summer play scheme run by the council which he loved doing. This was two days a week, which gave us and him some much needed time off to regroup! We went away to Somerset for a week and it rained every day, but we had fun. For some reason Sam refused to go swimming, we cannot explain it, his autistic side is becoming more and more apparent and he feels really unsure in unfamiliar situations which can be hard for all of us. For example, we are taking the children out for a meal on Boxing Day, and in order for this to go smoothly we are having to do a couple of trial runs so he is familiar with the restaurant and is happy to be there on the day. He remains seizure free at the moment, although there are no guarantees this will not change. He still has reflux and is frequently sick, vomiting up everything in his stomach, something he seems to have no control over. We are used to this and just get on with it, even Sam just says ‘Finished now-sick gone’. We have been referred to a specialist to have his autism officially diagnosed and are waiting to hear from them. This is an important step for Sam, who may need this diagnosis one day to access services. Went to see the neurologist at Great Ormond Street on Tuesday and had a positive meeting, discovering that the EEG Sam had in the summer was ‘normal’, and the MRI Scan showed that the site of his temporal lobe resection has shrunk, and the brain is functioning normally at present, so this was really good news. Sam is still visiting other departments at GOSH and has his next appointment for developmental Epilepsy and Speech Therapy on November 3rd. Thank you so much for the cards and little gifts we have received in the post for Sam, Sophie and Joe. We really appreciate it and Sam gets so excited now, he has reached a stage in his awareness where he anticipates what is inside the present and rips the paper off really fast. Before now it was a struggle, he did not grasp the concept that there was a gift inside for him, he was in another world a lot of the time. It took all day to get him to open a present himself, but now I can’t wait for Christmas, he will be such fun (fingers crossed) on Christmas Day and will be able to join in a lot more. However, there is always the fear that it will all be too much for him and he will not cope with it, so we will have to try and keep it calm for him. Sam is coming on amazingly well, and on 1st June it will be 1 year exactly since he had his brain surgery. He has made amazing progress in the last year. His speech has improved and his vocabulary has increased, but the most important thing is he has had no seizures in the last year. We are so grateful to the surgeons and staff at Great Ormond Street, as without their expertise Sam would be having a very different life to the one he is enjoying today. Sam still has major learning delays and communication problems, he has trouble pronouncing words and suffers from a bad stutter, but he is progressing every day. Sam’s behaviour is very up and down and he gets very frustrated with his lack of communication skills and he does like getting his own way! He is exhibiting some autistic behaviour such as hand-flapping and obsessive behaviours with certain objects, which is very frustrating for all of us. I would like to send big thank you’s to Berenice, Callum and Emma, Fiona, Helen F, Chloe G, Karen (Sami), Linda B, and Julie Barrett, for all the homemade cards, gifts and kind thoughts you have sent our way in the past month, they are really appreciated. We are thinking of all the pals who are struggling at the moment and remembering this time last year, when we too were living minute by minute, hoping for a miracle. Sam is living proof that miracles can happen, so keep strong if you are going through hard times. Sam is doing fine this month. He still has a bad stammer, but is coping well and has good and bad days. His behaviour is up and down, but his sleeping is better now he is on melatonin to help him drift off to sleep. He is looking forward to going back to school and wakes up each morning saying ‘I go school today?’ Bless him, let’s hope it lasts! We have had a lot of post and special thanks go to Jade Boyd, who sent really thoughtful gifts to all the children – THANKYOU! To Kate Dee for lovely cards and to Bereneice, Callum and Emma for great postcards from Cornwall. Also to Karen and Sami for a lovely homemade card. Lastly, thank you to the lady who sent a beautiful handmade Tomblibooos card for Sam, he loves it. We have just got back from Disneyland Paris, where we went courtesy of a local charity. Sam had a fabulous time; he loved seeing all the characters and the rides. The weather was cold but fine and we are worn out from all the walking! Sam is doing fine apart from the terrible stutter he has developed, which is so frustrating for both him and us. You can see him trying so hard to get the word out. The speech therapist says it is possibly due to his brain functions moving from the left side of his brain over to the right side following his operation last summer. It is a case of only time will tell. We have had some lovely post this month including a Tombliboos card from Helen in Plymouth, some great homemade Easter cards, and a sweet little gift for Sophie from Julie Barrett. Many Thanks for all these things, we love opening the post and Sam loves all the cards and books/puzzles he gets. The ideal age range to send Sam is 2 years plus, as he is developing slowly. His speech is becoming better, apart from the stammer, and he is attempting to say longer sentences all the time. We are so lucky he is doing so well. Sam has been having some swimming lessons which he seems to love and now he isn’t having so many seizures, it’s less of a worry for us. He still needs one to one in the pool though as he still has trouble concentrating and needs constant supervision in the water, but at least he is agreeing to get in the water now! Sam is developing into such a character, he is such a little monkey and so stubborn, but also such a loving and affectionate little man. Sam turned 5 on New Years Day and had a little party which included rides on a real fire engine with some friends and he really seemed to enjoy it. Sam has developed a stammer over the last couple of months, which makes talking really hard work for him. It is so frustrating for all of us to listen to him trying so hard and literally wearing himself out trying to say something as simple as ‘thank you mummy’. We begin 2008 with an appointment with the speech therapist who told us he has the worst case of stammering she has ever seen in someone so young. She is referring him back to Great Ormond Street to see a SALT there as she believes the stammer is a part of his recovery from his operation and should be treated neurologically. In the meantime, she would like us to try the Lindcombe Stammering therapy treatment, which involves lots of praise and acknowledging the ‘bumps’. She is not confident this will work as Sam has a very short attention span and a bad short term memory, but we will see what happens. So many thanks to the lady who sent Sam a Christmas gift which arrived late (I can’t remember your name or email) but he LOVED the puzzle and the other gifts which were at exactly his level of 2- 6 pieces per puzzle. We really appreciate it. Also lots of thanks, as ever, to Julie who sent lovely gifts for Sam’s birthday. What a year it has been for us. Sam has been on a journey, starting 2007 with up to 10 seizures a day, hoping he would be suitable for surgery to remove part of his brain, and leading up to his operation in June which was both a difficult and fantastic day for us all. The roller coaster ride following the surgery, starting a new school, and settling in well there with the odd bad day here and there. We were warned Sam’s behaviour could deteriorate, and he has become very emotional, obsessive and controlling since the operation. We are hoping it is part of his recovery. Lately he has shown signs of the old Sam, with fewer tantrums and aggression and the old sense of humour is back, so we are hopeful. We have had a very busy Christmas and New Year, with Sam’s 5th birthday on January 1st too. Joe, Sophie and Sam did very well this year; they were amazed to find they had letters from each of Santa’s reindeer and cards too! They also received presents from quite a few of Santa’s Elves, which were so thoughtfully sent, and quickly opened on Christmas morning! People have been so kind to us and a great support, we are very grateful. A big thank you to Bryan the Elf, and to Julie Barratt and all the other kind people for being so thoughtful. We are thinking of you. The room looks so bare now that Christmas is over. Sam is looking forward to going back to school, he gets overwhelmed very easily and this time of year really tests him, he will be glad to get back into some sort of routine. Still no seizures so far, it has been 6 months now. We are still adjusting to life without the threat of seizures looming over each day, and are finally nearly believing they are gone for good. Sam has a check up at GOSH in January, where we will probably have more MRI scans etc to see the after effects of his brain surgery. They say we must give it a year to be sure of the long term diagnosis, but he is doing well so far. Tomorrow Sam is having his birthday party, with rides on a real fire engine, and we are hoping he will really enjoy it, without missing it due to a seizure. A big thank you to Brian the Elf for sending Sophie a Christmas gift already, she can’t wait to open it. Also a big thank you to Julie for sending lots of parcels and gifts, including an Advent Calendar for Sophie. Thank you everyone for being so generous. Sam is keeping us on our toes at the moment, he does not seem to be able to sleep at all, and we are all very tired. His behaviour can be very disruptive and difficult, and his school is referring him to behaviour therapy. This bad behaviour could be due to the operation he had in June, a part of the normal recuperation following brain surgery, which will stabilise over time. It could be the effect of the reduction in the medication he was on for epilepsy, which was a mood stabiliser, or it could be that he is functioning at the level of a normal two year old and these temper tantrums and frustrations are a part of his normal level of development. Anyway, we are hoping it calms down soon, as we are all feeling the strain – even Joe and Sophie cope with a lot of disruption and aggression from Sam at times. Sam is getting on really well at school, with only the occasional tantrum if he does not get his own way! Luckily the staff are excellent with him and deal with him perfectly. He has developed some strange obsessions including flushing the toilet each time anyone uses the toilet, which he gets upset about if anyone else does it first, but we are stressing the fact that it is not his sole right to flush the toilet each time, and other people have ‘flush rights’ too!! His autistic tendencies are becoming more apparent now that the seizures are stopped, and it is increasingly hard to get him to cooperate in certain situations. We are hoping this will be temporary, and part of the recovery from his operation in June. Sam will be 5 in January and I don’t think he could cope with a party this year, so we have just booked for him to go for a ride on a fire engine, which we are hoping he will love! Many thanks to our great friend Julie, who has sent many great little treats and gifts in the mail, including some fabulous Halloween pressies. The children all benefit and they send big hugs! Many thanks to Julie Barrett, who sent Joe, Sophie, and Sam each a lovely gift from her holiday to Cornwall. It is much appreciated, as are the wonderful letters received too. Also to Sam, aged 6, who sent Sam a lovely letter, which we wrote a reply to. Sam has had a good month; he had his MRI Scan at Great Ormond Street, to see why his head has started to swell up where he had the operation. We went back for the results last Monday, and the scan shows that in the space where they took out the temporal lobe, it has filled with cerebral fluid, which has caused the swelling. The consultant says that the fluid is not causing pressure on the brain, but is keeping an eye on the swelling. We have the next appointment in January, so fingers crossed there is no further swelling before then. So far Sam has had no more seizures, and is continuing to do well at school; his speech is really improving in his day to day conversations. The GP has requested attempt to withdraw the antihistamine medication that Sam was on to help him get off to sleep at night. He has had none for three nights so far, and it has been okay. He is still taking up to an hour to get off to sleep, and is waking up very early, so it has been quite draining, but it is better than before he had the medication, when he would take hours to get off to sleep, crying himself to sleep, wake up frequently at night, still crying, and be miserable all day!! So at least things have improved since then hopefully! The weather is getting colder and wetter, so Sam is going to miss his outdoor playtimes when the rain really sets in. He loves to play out in the garden in his little red car and on the slide. Hope you have all had a good summer. Sam recovered well from his surgery over the summer, but has had possible complications which became apparent when his head started swelling up last week. After a trip to A+E, a day at Great Ormond Street, and then an X-Ray, the consultant Surgeon said it is just swelling for no apparent reason, but was not anything major to worry about and has booked Sam in for a CT Scan to confirm this theory. We are pleased about the CT Scan as until there is proof there is nothing sinister going on inside his head, we find it hard to believe his head would swell up for no reason. Sam is fine despite the swelling, and more than ready to begin school next week. His sleeping has been awful these past few weeks and his behaviour has been very up and down, with lots of crying and screaming. He has also been unable to cope with any situation which is unfamiliar, or crowds of people. This has been frustrating for all of us. I am hoping he can be assessed for ADHD, and a mild form of autism, which is the only way I can explain his bizarre behaviour. Hopefully if he has ADHD or suchlike, we can get him the help he needs to cope with it. Thank you to everyone who has sent cards this month and to Post Pals who sent Sam a lovely knitted toy (which is now sitting on Sophie’s bed!) Thanks for your support through this long hard summer, we really appreciate it. Sam has still had no seizures since the operation in June, which is fantastic. We are seeing a big improvement in his speech and vocabulary, but he is still getting very frustrated when we cannot understand what he says. His sleep is still affected and we have had many broken nights, where he wakes up at 3am and is ready for the day and then falls asleep at 6am, leaving us exhausted for the whole day. We have the follow up appointment at Great Ormond Street on 13th August, where they will tell us exactly what it was that they took out of his brain, a cyst or possibly a slow growing tumour, but the surgeon has told us not to worry (easier said than done!). We have been busy in the school holidays with lots of trips to see friends, BBQs and daytrips. Trying to wear Sam out every day is hard work! Our house looks a tip, I will get no house work done until they go back to school in September, AND the washing machine broke down. Many thanks to everyone who has sent cards this month, Sam received a great Bob the Builder card all the way from Alabama, USA, which he laughs at every time he sees. Have a great summer and hope everyone is keeping well. Sam has still had NO SEIZURES so far, so he has done really well. His scar from the operation is healing nicely, and he is his usual cheeky self! The only complaint we have is that now the seizures have stopped, he is not sleeping! Must not complain, hopefully this is just a phase! He has been spoilt this month, with gifts all the way from North Carolina. Many, many thanks to Susanna and her wonderful family for sending gifts to all the children, they really are over the moon with them. Sam got a gorgeous Fireman Sam blanket, Sophie got some cute stickers for her room, and Joe was thrilled with his Star Wars Beach Towel. Sophie has been excited to receive more cards and gifts from Julie Barrett, and photos of the dog Julie helps to look after, and Sam has had beautiful home made cards from Kate Dee, and from Ellyn from Alabama. We also got a lovely email from a lady whose son is going through similar to Sam and she found us through Post Pals, which I thought was lovely. I wish I had more time and could write and thank you all each time you are thoughtful enough to think of us and send something, please know we really appreciate it. We got back from our holiday to Cornwall yesterday, which was a nice break away. The children spent lots of time playing on the beach and splashing in the sea. The weather improved over the week and we had lots of fun. Sam has two weeks of nursery left, and then we will have the summer holidays before he starts at the special school in September. He has visited a few times and I think it will be lots of hard work for him, there is a long way to go, to improve his concentration, speech and understanding, but now hopefully the seizures have stopped things will be calmer for him, and he will come on quicker. Fingers crossed!!! Sam is doing really well following his surgery on Friday. Thanks for all the messages of support you have sent, we really appreciate it. All is well here, but very busy. We are preparing for Sam’s trip to hospital for his operation. We found out that Sam has been given a place at the special school we wanted too! This is a big weight off our minds, as now we know he will get the support and care he needs at school. Many thanks to Kate Dee for the great cards, and to Julie Barrett for the lovely letters and gifts received this morning (Joe is most impressed with your wrestling knowledge!) Also many thanks and hugs to Susanna and family from North Carolina, who sent a big box of teddies and books. Sophie and Sam are over the moon with them and Sam has insisted on taking the Fireman teddy everywhere! He is practising the zip and buckle too. Thank you all so much, it is lovely to know you care. Well, we finally have a date for Sam’s operation. We will be going in on May 31st for a stay of up to a week. The operation is called a temporal lobe resection, and the surgeon is very confident that it could help Sam. They will only be able to remove 85% of the damaged tissue though, which lowers the odds of Sam being seizure free following the operation, but we are hoping it will still have some positive effect on them. It is very scary, but we just want to get it over and done with now. Sam has been very demanding over the past few weeks, being extremely angry and quick tempered, and the stress is showing on us all. Hopefully things will improve following the operation. Please send lots of extra smiles for Sam while we are at the hospital! Sophie’s school has begun a Young Carers Club, and there are about 6 children in the school who have someone in their family who needs ‘special looking after’. She loves going to the club, where they are doing lots of art and craft projects, and talking about the person they help to care for. I am really pleased the school has recognized the special role that siblings play, and the effects on them, of having someone who is poorly in the family. Sophie showed her whole class the Post Pals website, and explained what it does to them all. Well done Sophie! Many thanks to everyone who has sent post, especially Julie Barratt, who always sends nice things. We really appreciate it; Sam loves all the lovely cards, and Sophie and Joe love receiving post too. Sam has had a good month. We have been up to GOSH and he is finally on the waiting list for the operation. He should have it in July or August, but obviously it could be delayed. The surgeon told us about all the risks involved, which are not to be taken lightly, but we feel that we must give Sam the chance of a life without seizures now he has been offered the chance. Sam loves going on the train up to the hospital and loves playing havoc in the doctors consulting rooms! Easter holidays are here and Sam will be spending time with Joe and Sophie. We are planning a few days out, which he will enjoy, especially to the farm which he loves. Happy Easter and loads of hugs to all who have sent mail this month, we are really grateful. Sophie, especially, has had a good month with gifts from Julie Barratt all the way from Crufts. Thank you so much. Sam has had a good month and has been doing well at nursery, with the odd exception. We have had news from GOSH that Sam’s case is being discussed on Tuesday, and they will decide if he can have the operation at the meeting. So fingers crossed for us!! We have also been writing reports for Sam’s statement and doing all that we can to get him a place at a local special school. Sam’s seizures have been quite bad, with lots of very little episodes that are wearing him out. He has been quite out of it at times, poor little thing. We are waiting to hear about a new medication from the local hospital. Many thanks for all the kind postcards and cards for all the children, especially the Valentines cards!! Sam has been very lucky to receive a card and a gift all the way from Sweden this month. We really appreciate it. Sam has been up and down this last month. As we have been increasing his medication, his behaviour has got more aggressive and violent; to the point where he was so hyperactive he couldn’t sit still. We realised it must be the medication causing this and have dropped the levels to what they were a couple of months ago, and we have our little boy back, still full of beans but calmer and more able to concentrate, and all the aggressive behaviour has gone. Just shows what effects medication can have. We are trying to get Sam a place in a special school, and feel we are in for a bit of a battle, as the EP is questioning if he has learning difficulties. He really does have learning difficulties, but is so up and down that if you catch him on a good day he surprises you with what his abilities are. With the operation at GOSH looming in the summer, and the setback that could cause, I feel the only way forward is in a special school. Any advice on how to support our application for a place in a special school for Sam would be much appreciated. Sam’s seizures are still occurring regularly, with no sign that the change in medication has made any difference, so it could be that the surgery is our only hope. A big thank you to Julie Barrett, Alan Barrett and Kate Dee who always send delightful little cards and gifts, Sam loved the playing cards with Bob, Tweenies and Fimbles etc. Sophie loves receiving the letters and cards, and is attempting to write a reply. Joe loves getting things in the post too. Many thanks to everyone who have sent cards and gifts and been so supportive, it really helps to know we are not alone in this. Sam has been doing okay. We have two appointments at GOSH next month, a psychological and neuropsychiatric assessment. These will be the final appointments before Sam is offered surgery (or not). Sam has been having frequent overnight seizures, which has been making him quite sleepy in the day sometimes, which in turn affects his speech and behaviour, and ability to learn. This is quite tough on all the family, but we are all looking forward to Christmas. Sam does not really understand about Christmas yet, but I am sure he will enjoy all the presents! Many, many thanks to Julie Barratt, who has been looking after Sophie and Sam with lots of letters and gifts, they are very much appreciated, especially the advent calendar. Thank you to Kate Dee, Alan Barratt, and to Despina, all the way from the USA. Also, many thanks to some of the other postpals, who have sent Sam some lovely cards and stickers. He says a big thank you! Sam loves all the lovely postcards and we have quite a display now, full of bright colours and characters. Sam has been up and down this month. We have had quite a few appointments, including the geatroentologist, neurologist, occupational therapist, speech therapist and a visit to the Royal Free hospital for a food intolerance breath test, so we have been very busy!! Many, many thanks to Julie Barratt, who has sent some wonderful gifts and cards, to Alan Barratt, to Post Pals for sending Sophie a great art and craft bucket, and thank you for the card all the way from Singapore!!! Sam is very tired at the moment and his seizures are still bad at night, he falls into bed exhausted each night. Happy Halloween to you all. Sam has settled in to nursery well, and seems to enjoy his time there. We have an appointment at GOSH on Tuesday with the neurologist, to discuss surgery options for the removal of the cyst. Sam’s seizures are still very unpredictable, often happening at night, and are probably moving on from complex parial, to secondary general tonic clonic type seizures, which we will discuss with the neuro. Sam is on the whole coping well, but can get upset at times, as he doesn’t understand what has happened to him. Many thanks to Julie Barratt for the lovely letters, gifts and postcards to Sam and Sophie, which we will reply to as soon as there is time. Sophie has loved receiving mail, and feels very grown up. Thanks also to Ruth, for the gorgeous tiger for Sam and the letters and also thank you to Kate Dee for the wonderful cards. We really do appreciate everyone’s kind thoughts; you really keep us going, especially on bad days. Sam came home this morning from Great Ormond Street Hospital. He has been in for 3 nights for telemetry monitoring and an MRI Scan to see if he is suitable for surgery to remove the cyst from his temporal lobe, and the results show the seizures are beginning in the temporal lobe, meaning the Neurologist will probably recommend surgery, so we are now awaiting our next appointment. We have an appointment at the Royal Free Hospital to see a Gastroentologist to see if Sam’s weight has stabilised following his recent change to a dairy-free diet, and for further investigations to see if Sam has more food intolerances. We had a lovely holiday in Cornwall, and came back good and tired! Sam has been so naughty this summer, both he and I are looking forward to the start of the school term next week, the summer has gone so quickly, and we have been so busy, but Sam likes structure, so nursery will do him the world of good. Many thanks for all the lovely post for Sam, and the letter to Sophie from Julie was a treat, Sophie insisted on replying straight away!! Thank you also to Julie and Alan Barratt, Kate Dee and the Agawok girls. We had an appointment at the Royal Free Hospital on 5th July and saw a gastroentologist who recommended a dairy free diet for Sam, to try and resolve his bowel problems and very loose motions. We have managed to get him onto this, with good results so far!! We will review if the diet has been a success in 6 weeks at a follow up appointment. By the way dairy free chocolate is lovely, but do not ever eat dairy free cheese – YUK!!!!!!! We have a date for Sam’s admission to Great Ormond Street at the end of August and we are looking forward to getting the results of the scans, to see if Sam is suitable for surgery or not. Many, many thanks to everyone for all your kind thoughts, cards and gifts. Thank you to Julie Barrett for all the wonderful cards and postcards, to Alan Barrett for the toy tractor and cards, and to Becky Butler, it was lovely to hear from you, thank you for the lovely Bob the Builder book, Sam loves hearing this again and again! Thanks also to Victoria for the wonderful homemade dinosaur card, and to Cherie Vincent for the super homemade Giraffe card, and to Kate Dee for the lovely Jungle card. We have all the cards up on display and Sam loves looking at them and telling me to look at them!! Sam is doing really well, and is still attending the mainstream playgroup, and also First Step, a special needs playgroup. Look for www.firststep.org.uk to see all the good work they do with a large number of very special children. We had another trip to the hospital this morning for blood tests, which is quite traumatic for us all, as Sam seems to have barely any blood and it takes lots of attempts to get any blood out. We also had a trip to A+E on Sunday night following a cluster of seizures and he had diazepam emergency medication for the first time, which was scary. Sam’s seizures are still very unpredictable, occurring both at night and in the daytime, but he is coping very well and is still a cheerful little chap. Sam recently attended an appointment at Great Ormond Street Hospital and is on the waiting list for overnight telemetry monitoring and an MRI Scan, to assess if he is suitable for surgery to remove the cyst in his temporal lobe. We are waiting to hear from them. Sam is currently on a new medication and seems more alert and full of beans! The seizures are still occurring daily (and nightly) though. He has been seeing a speech therapist, and will be starting nursery in September. Sam’s bowels are still not quite right, causing him to be still in a nappy, but I am hopeful he will be referred to see a gastroentologist to find out what the problem is there. A big THANKYOU to Victoria for the lovely homemade card, to Alan for the cuddly dog, to Julie Barrett for the toy tractor and the postcard from the New Forest, to Online Angels for the lovely blanket, to Post Pals for the cards to Joe and Sophie, and all the love we have received. It really helps us to know we are not alone. Sam loves opening the post every morning now.